The Linear Regression Indicator is used for trend identification and trend following in a similar fashion to moving averages. The indicator should not be confused with Linear Regression Lines — which are straight lines fitted to a series of data points. The Linear Regression Indicator plots the end points of a whole series of linear regression lines drawn on consecutive days. The advantage of the Linear Regression Indicator over a normal moving average is that it has less lag than the moving average, responding quicker to changes in direction. The downside is that it is more prone to whipsaws. The Linear Regression Indicator is only suitable for trading strong trends. 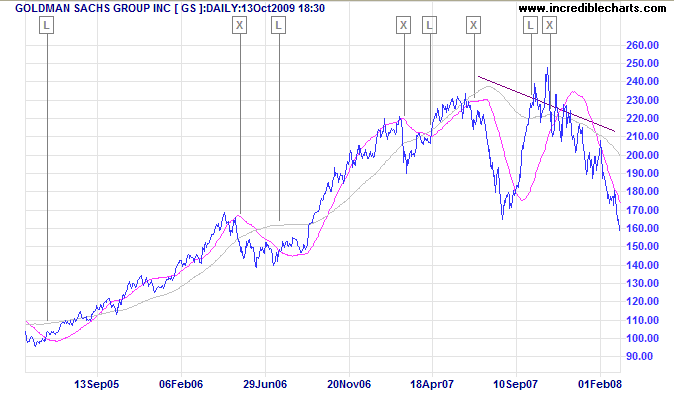 Signals are taken in a similar fashion to moving averages. Use the direction of the Linear Regression Indicator to enter and exit trades — with a longer term indicator as a filter. Go long if the Linear Regression Indicator turns up — or exit a short trade. Go short (or exit a long trade) if the Linear Regression Indicator turns down. A variation on the above is to enter trades when price crosses the Linear Regression Indicator, but still exit when the Linear Regression Indicator turns down. Goldman Sachs is displayed with 100-day Linear Regression Indicator and 300-day Linear Regression Indicator employed as a trend filter. Exit [X] when the 300-day Linear Regression Indicator turns down. Bearish divergence on the indicator warns of a major trend reversal. Setup for the Linear Regression Indicator is simple. The default time period is 63 days. This can be varied between 14 days and 300 days depending on the wave-length of the trend you are tracking. The formula uses the sum of least squares method to find a straight line that best fits data for the selected period. The end point of the line is plotted and the process repeated on each succeeding day.